The 48-liter Alpinisto, designed to offer multi-sport functionality, is aimed squarely at backcountry skiers and winter mountaineers. Thanks to an intelligent set of attachment points, the Alpinisto will carry all your winter tools with ease. And unlike many of its competitors' tool-carrying systems, the Alpinisto's attachment points never feel superfluous or gimicky. I certainly scowled the first time I looked at the Alpinisto's tool attachment points. Here we go again, I thought, one more overly-complicated replacement for the perfectly good axe loop and daisy chain. I must somewhat sheepishly confess, however, that the more I used the Alpinsto's non-standard tool system, the more I liked it. The Alpinisto features Gregory's 'Wraptor' suspension. While it isn't particularly stiff, it does seem (at least for short tours) to keep the weight on the hips and off the back. And the Alpinisto strips easily to save weight. The Alpinisto's Backpanel features a center ventilation channel, as well as thick, breathable foam padding. Inside the pack, you'll find a folding bivy pad which is big enough enough to replace your thermorest—a neat trick! The hip belt is thickly padded and angled to carry loads comfortably. You can remove the padding (while still having a functional waistbelt), as well as the bivy pad and the frame, bringing the total weight down by a pound or so. Given the prospect of a Gregory pack with a robust suspension, winter tool attachments, and the ability to strip down, you'd think this pack would be a slam dunk. 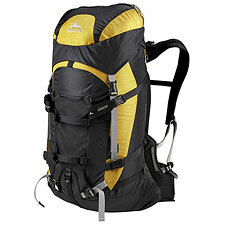 Unfortunately, the Alpinisto has the dubious distinction of being the heaviest pack in its class, at a staggering 4 pounds, 11 ounces (just four ounces less than my 70L Gregory Makalu Pro!). To cut to the chase, weight is the elephant in the room with this pack, which would otherwise trounce its competitors. Out of the box, the Alpinisto's weight is probably the first thing you'll notice. I hefted the pack again and again, as if hoping that by lifting it enough times it would somehow become lighter. The source of all this weight is obvious: Gregory hasn't made much effort to shed ounces in the Alpinisto's construction. That probably rules this pack out for adventure racers—unless carrying one or two extra pounds doesn't matter. Weight concerns fade temporarily, however, as soon as you put the Alpinisto on your back. Even when completely empty, the Alpinisto maintains an excellent shape, thanks to Gregory's wholistic approach to frame, suspension, and paneling. The Alpinisto would seem to be ideal for heavy, awkward, uneven loads that would quickly overwhelm lesser packs. Aside from weight—and an ill-fitting waistbelt—I did find the Alpinisto on the smallish side. The pack is 48 liters according to spec, but the shape of the pack, plus a pointlessly tiny expansion collar, make it feel smaller. Overall, my reaction to the Alpinisto was quite mixed. I loved the pack's quality, design, and construction. Clearly, a great deal of thought has gone into each. But I am a small, light climber who carries a lot of gear, and the Alpinisto and I were therefore not an ideal match.